Just call it a mom and daughter merger. A mother-daughter-owned spa, tattoo and piercing studio that opened November at Ann Arbor's Briarwood Mall is succeeding in an atmosphere dominated by corporate chains by appealing to a diverse base of clientele. Tiffany Cole and her mother Kathy Champagne launched A Unique Design at Briarwood Mall in November. A Unique Design is located in the MC Sporting Goods wing of Briarwood Mall. 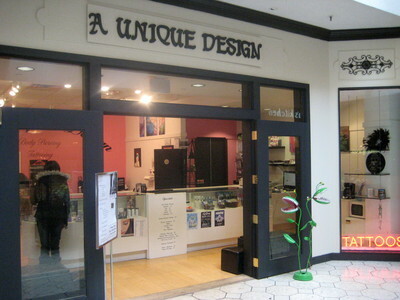 Champagne believes that being located in the mall in a spa-like atmosphere allows A Unique Design to appeal to customers who may not be as comfortable in other tattoo shops. “We had one man come in for his 80th birthday saying he always wanted to have his ear pierced, and he was getting it done today,” said Champagne. He selected a diamond stud in one lobe. A Unique Design is located in the MC Sporting Goods wing of Briarwood Mall, across from Olga’s near JC Penney. A fully-licensed cosmetologist and esthetician, Champagne has worked in the mall for the past 30 years, first at Macy’s when it was still Hudson’s, and later as a trainer at Tricho Salon. Her daughter, Tiffany Cole, owned a tattoo parlor in Romulus called Poison by Design where she did tattooing and piercing. The two decided to combine businesses to help each other out. While Cole handles body piercing and tattooing, Champagne specializes in eyelash extensions, waxes, facials and tanning. Since opening on Thanksgiving weekend, business has been better than expected. Their grand opening kicked off at 3 a.m. on Black Friday. Champagne is still surprised at how mainstream tattoos have become. “We get walk-ins constantly. Ladies will eat at Olga’s and then stop in for a tattoo or piercing,” she said. She says the shop draws a lot of older customers who have always wanted to have work done. A Unique Design sold several gift certificates over the holidays to mothers who wanted them for their children. Their kids wanted work done but they didn’t want their friends to do it or go somewhere where people aren’t experienced. Both Champagne and Cole work full-time at the shop along with four tattoo artists and three body piercers. Laura Blodgett is a freelance reporter for AnnArbor.com. Thu, Jul 19, 2012 : 6:49 p.m.
Kathy and Tiffany are the nicest people in the world.??? ?I know both of them and I highly recommend this shop.???? In 5 years I'm opening a tattoo removal shop. I will make millions! Who's in? Mon, Mar 12, 2012 : 3:40 a.m.
Good luck to them. It's funny to me that people are so condescending and rude toward these women in this comments section, while they're out there trying to be productive members of society. But then this just wouldn't really be Ann Arbor, would it? Sun, Mar 11, 2012 : 10:43 p.m.
Sun, Mar 11, 2012 : 10:24 p.m.
Sun, Mar 11, 2012 : 10:06 p.m.
You know who else liked to tattoo people? Mon, Mar 12, 2012 : 4:39 p.m. I have seen this exact same question posed a number of times and it always leads towards a discussion of people being tattooed during the Holocaust. Are we really supposed to believe you were actually talking about another tattoo shop? Why make you statement in the past tense? Mon, Mar 12, 2012 : 5:04 a.m.
Mon, Mar 12, 2012 : 12:21 a.m.
Sun, Mar 11, 2012 : 11:45 p.m.
Sun, Mar 11, 2012 : 11:07 p.m.
Oh no, not this argument. I'm assuming you are referring to the Nazis using tattoos to identify prisoners during the holocaust. Just because something was used during a terrible time in history, doesn't make it wrong to use it in a completely different context today. There is a big difference between being forcefully tattooed in order to be identified, and taking a trip to the local mall to get an artistic and meaningful tattoo. Sun, Mar 11, 2012 : 9:54 p.m.
Wow, I can't believe these comments are from Ann Arborites. Sounds more like a bunch of stodgy conservatives. Wth?? I think it's an awesome idea, and a great departure from typical, mainstream mall fare. Hope they continue to thrive!! Sun, Mar 11, 2012 : 10:32 p.m.
Sun, Mar 11, 2012 : 6:53 p.m.
Maybe I'm just an old fuddy-duddy, but all these tattoos on women make them look like prison lifers. Mech. Mon, Mar 12, 2012 : 5:51 a.m.
try being a chick out in the dating world, I havn't met one man within 10 years that doesn't have a tattoo, I have only my ears pierced and men are always shocked to meet a girl without body piercings or tattoos. Personally I think tattoos are trashy and I have zero desire to get one or see one on a naked man. Sun, Mar 11, 2012 : 4:54 p.m.
&quot;Mom and daughter entrepreneurs open 'tattoo spa' at Briarwood Mall&quot; &quot;Their grand opening kicked off at 3 a.m. on Black Friday.&quot; Once again, A2.com right on top of things... It made me check the date to make sure I hadn't pulled up an article that was stuck in my browser cache of some archive. Sun, Mar 11, 2012 : 4:07 p.m.
Gotta' love that an 80 year old man decided to get the piercing he always wanted. Tattoos are not my thing, but they are undeniably &quot;part of the landscape&quot; anymore. I wish them well. Who's the mom and who's the daughter.....wow, I'll have what that mom is having! She looks great! Sun, Mar 11, 2012 : 1:19 p.m.
Sun, Mar 11, 2012 : 12:03 p.m.
Sign of the times: Ann Arbor trading in bookstores for tattoo parlors. Sun, Mar 11, 2012 : 10:10 p.m.
As soon as you hear about digital tattoos, you be sure to let me know (whips out his iPad and continues reading A2.com posts). Sun, Mar 11, 2012 : 11:58 a.m.